Another stop motion classic from the atomic age. Giant scorpions awakened by volcanoes menace Mexico. 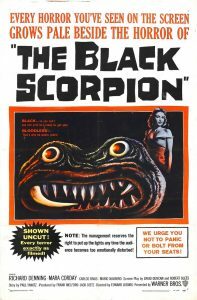 You think a swarm of giant scorpions is bad, wait until you see the biggest and baddest of the bunch…The Black Scorpion!! Willis O’Brien (the effects genius from King Kong) gets more than alittle help from Pete Peterson animating these arachnid monstrosities in all their stop-motion glory. The effects were very well done, but unfortunately the transparent matte shots of the Black Scorpion entering Mexico City are terrible. Almost to the point where it ruins the movie. As is the constant (once or twice would be enough) close up of the scorpions face (which is a drooling animated prop). It would have been wonderful to see the Black Scorpion trashing buildings and attacking people in the city rather than a poor matte shot of the scorpion running through the streets. Still overall a very enjoyable flick. The acting was actually pretty good compared to most of the genre films from the time. The best scene from this film (hands down) was the descent into the underground lair of the scorpions, which also features not only a giant freaky worm, but a huge freaky looking trapdoor spider as well! The spider and worm prop were from the famous deleted “bottom of the ravine” scene from King Kong. So this is as close as you’re going to get to reliving that infamous lost scene. Other great sequences include two scorpions battling the giant worm in a fight to the death, the scorpions swarming over and attacking a train at night, the Black Scorpion slaughtering the smaller scorpions, and the climatic fight between the Black Scorpion and the Mexican military in a soccer stadium. I miss these kind of movies!